If you are looking for information on the Realty World franchise business opportunity, Realty World franchises or Realty World franchising, then you have come to the right place. Put Our Billion Dollar Name To Work For You! If you're a licensed real estate broker or agent seeking a better system for success, Realty World® - an international franchise organization with over 30 years of excellence in the industry - may be for you. At Realty World®, we've reinvented the real estate business system by combining the best features of the traditional franchise with the flexibility and profitability of the non-traditional broker network. Our system is based on a "menu" of services which members may select from and pay for at the time of use and which have been perfected to maximize profitability and effectiveness in today's real estate market. The franchise fee is $18,000, and members pay a low flat monthly royalty - not a percentage of gross. We are committed to the professional development of all of our members and offer intensive leadership training for our brokers and managers and a true life time residual income program for agents with six levels, paid monthly. Our state-of-the-art collateral marketing tools and technologies equip our members to serve the consumer and our powerful brand name - one of the most recognized in real estate - positions us in the customers' minds as a leader in the industry. 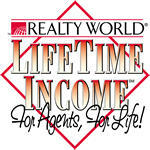 Come Discover The Power Of Joining The Realty World® Organization. Each Realty World® Office Is Required To Have A Licensed Real Estate Broker On Staff. Franchisees Must Provide A Sponsoring Broker Or Be Willing To Acquire A Broker's License Prior To Opening Their Office. Each Realty World® Office Is Also Required To Have A Minimum Of 1,500 Square Feet Of Commercial Office Space.